New England is well known as a distinctly American region rich in history, culture, and natural beauty. It is particularly known for its brilliant autumns (fall) to drive lazily through mountains blanketed with gold-and-red foliage. There are also plenty of other things to do such as stopping at country stores, orchards, local restaurants, wandering through antique shops lining a peaceful village green, exploring the museums and shopping of the cities, or to get a head start on some cool day hikes in the mountains and countryside. Drive across New York City, onto Long Island for two nights in the Hamptons. Take the ferry to Connecticut before heading to Newport, Rhode Island for two nights. Explore Cape Cod and the fabulous city of Boston for a few days, and then drive north up the Maine coast to Camden. The tour then turns inland, across Maine and New Hampshire to Mount Washington and onto Stowe, Vermont, giving plenty of time to take in the mountains. Enjoy a weekend in southern Vermont in true New England style. 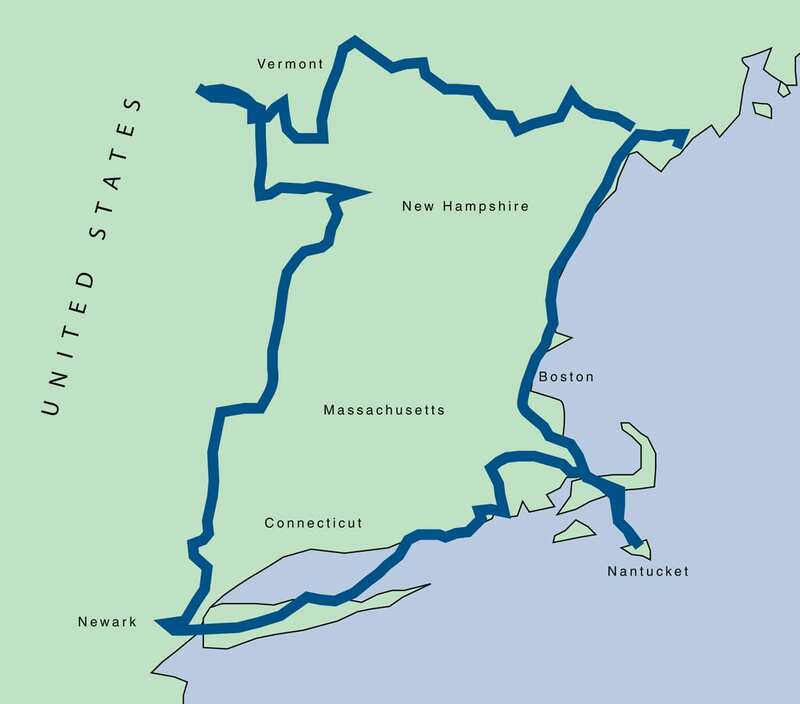 The tour winds its way south, through Massachusetts and the Berkshires, then finally through Connecticut back to New York. The final night of the tour will be in New York, with an option to extend your stay for those who wish to take a bigger bite of the Big Apple. Our carefully chosen route ensures that we pass by some lovely places to see and visit each day. We stay off the main roads and highways as much as possible, and the traffic is light and the driving easy. We have written detailed route directions for your convenience, and describe all the sights to see and recommend places to visit or eat. This tour is ideal for September/October for the colours, although enjoyable at any time of year. 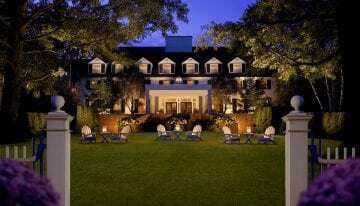 Arrive in New York, collect your rental car and stay overnight in a fabulous hotel on western Long Island. Drive along the pretty north shore and then across Long Island to the Hamptons. 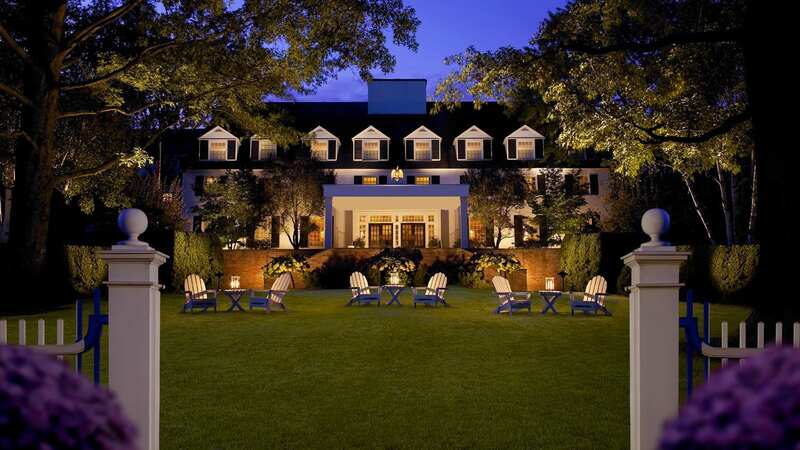 Stay overnight in a wonderful hotel in East Hampton, the centre of chic. Enjoy an afternoon walk on the beach, and drive around the exclusive residential areas to see many of the beautiful houses in the area. Drive out to the south fork and Montauk – for windswept wilderness. Head up to Sag Harbor and onto Shelter Island to Orient Point on Long Island’s North Fork and take the ferry across to New London, Connecticut. Drive along the coast, visiting the lovely town of Mystic, best known for its naval history and the wonderful Mystic Seaport, along the way. Stay for two nights in a gorgeous hotel in the centre of Newport, Rhode Island, America’s yachting capital and a town renowned for its mansions. The hotel has a wonderful spa and pool, and is in easy walking distance of all the major sights. Spend the day exploring Newport, discovering some of the incredible mansions (ironically called ‘cottages’) that are ubiquitous in the town and along the cliffs. Enjoy the 3.5 mile cliff walk which allows you to see many of the mansions from their gardens, as well as being able to visit some of them to see the luxurious and gilded interiors. This is a really charming town, with many wooden buildings dating back to the early 18th and 19th centuries, which gives a serene air to the numerous back streets. The waterfront has lots of lovely restaurants and bars to take in the sights and sounds of the marina and some stunning yachts. Try a sunset cruise from 5.30-7pm on an 80ft pilot schooner for a cruise around the harbour and Narangassett Bay. Drive along the coast into Massachusetts. Head along the pretty south shore of Cape Cod from Falmouth to Chatham and stay overnight in a lovely inn, a collection of several houses dotted around. It’s just 200m to the main street of this genteel village, which has galleries, stylish shops, and the Wild Goose Tavern for a well-earned beer or sun-downer. Revel in the quintessential New England coastal style, with weather-board seafront houses and sandy beaches. Spend some time on Cape Cod, discovering the pretty villages, beaches and scenery on the way north to Provincetown in the far north of the Cape. Whale watching tours are on offer here too. Return back down and head along the lovely north shore, dotted with old fishing villages, before driving north to Plymouth, home of Plymouth Rock, often considered the landing place of Pilgrims in 1620. There is also a replica of the Mayflower boat. Continue into Boston and stay for two nights at a wonderful and luxurious hotel right on the harbour, with secure underground parking. The hotel has a fabulous pool and spa. Enjoy exploring the cosmopolitan city of Boston. The city is the largest in New England and one of the oldest in the United states. Take a day off from driving and use the chance to see its superb museums, art galleries and perhaps a spot of shopping. Walk the Freedom Trail or take a trolley bus ride, to see the historic sights. Drive up the Maine coast, through lovely towns such as Ipswich, Portland and Kennebunkport, to Boothbay Harbor, itself a pretty fishing village. Stay for two nights in a delightful and charming hotel on the shore, a couple of miles from Boothbay Harbor, with gorgeous views of the bay. If the weather is good then there will be a whale watching boat trip (3.5 hours) from Boothbay Harbor. There are humpback, blue, fin, minke, pilot and northern right whales off the coast. Or relax for the day on the beach, take a kayak out to explore the bay, or take a circular tour to discover the attractive towns of Camden or Rockport, and other seaside villages in Maine. Dinner is at leisure and there is some great seafood to be enjoyed. Head inland on some great back roads to the New Hampshire lakes region, skirting around the shores of Lake Sebago, and then driving around Lake Winnepesaukee. Stay for two nights at Mill Falls in Meredith at the north end of the lake, at a truly gorgeous hotel (and very popular – on our last tours no-one wanted to leave), with a superb ‘polished rustic’ interior, situated right on the shore. Enjoy a wander around Mill Falls, with it’s little shops and lakeside promenade, or savour the view from the outdoor hot-tub. Dinner is included. A circular drive up to and around Mount Washington. Drive north to the White Mountains and drive up the auto road to the summit of Mount Washington at 6,200ft. The views are incredible and the colours really start to be noticeable here across the broad valleys smothered in the reds, golds, yellows and greens of the trees. Dinner is included at the hotel again. Drive along the stunning Kangamagus Highway, which runs alongside the river and is a superb route for ‘leaf peeping’. Head through the Franconia Notch and onto Stowe, Vermont. Stowe is renowned as a ski resort but is wonderful at any time of year. It’s a small town surrounded by wide-open country and woods. Stay for two nights at an alluring hotel with the most glorious views of the mountains, enhanced by an incredible spa, indoor and outdoor pools and hot tubs – a very decadent place to watch the sunset. Explore the Stowe area with a short circular tour through the Smugglers’ Notch, a very narrow, rocky route with fabulous views. This region is also known for its maple syrup production, and there are products aplenty to sample made with this beautiful sweetener from the surrounding trees. Head south to Waterbury, home of Ben & Jerry’s ice cream (a must-visit for fans). Continue on to absolutely outstanding Shelburne Museum, known as ‘America’s attic’, and one of the best visits in New England – an outdoor museum-collection of over 30 buildings from across the region showcasing architecture and traditions. Next door is the Vanderbilts’ showcase Shelburne Farms. Drive south, crossing the mountains and drinking in the fall colours draped over the hillsides, punctuated with green, open meadows, jewel-like ponds and grazing cows. Stay for the next three nights in a wonderful and charming hotel in the centre of the gorgeous village of Woodstock. Spend the weekend in Woodstock, either relaxing, or exploring the local area. There are some lovely walks, or enjoy pottering around pretty villages, browsing farm stalls and visiting museums and galleries. The driving is also superb, with drives over the Quechee Gorge, ‘Vermont’s Little Grand Canyon’, and snaking along river valleys. Visit the excellent Billings Farm, or Marsh-Billings-Rockefeller homestead, a true forerunner in environmental conservation. Leave Woodstock and drive south for a shortish day heading south through the hills of old Vermont, stopping at the pretty village of Weston to visit the diminutive historical centre and the wonderful old-fashioned country stores, before heading on to Peru and Manchester. Just a little south of Manchester is Hildene, President Lincoln’s family home – well worth a visit. Drive just 6 miles to Dorset to stay for two nights in a really charming and delightful inn on the village green. Discover the area around Dorset with a circular drive filled with some glorious winding mountain roads, tempting stops and photo opportunities galore. Visit the smart outlet shops of Manchester for a spot of shopping, wander down the wide village green of Manchester Village, enjoy a stroll around the country’s oldest marble quarry which is now a beautiful lake, or explore one of the oldest general stores, which is like a step back in time. End the day sitting in a rocking chair on the front porch with a local drink such as hot apple cider or brew in hand. Drive south through the Green Mountain National Forest and take the Equinox Skyline Drive, which offers magnificent views, the tightest hairpin turns in Vermont (this won’t impress Europeans as much), and an overlook of the only Carthusian monastery in North America. Cross into Massachusetts once more and from North Adams take the Mohawk Trail east to visit the pretty and historic town of Deerfield, with many old houses to visit. Drive across the Berkshires to Lenox and stay for two nights in a beautiful hotel just outside town. Explore the area around Lenox with a wonderful drive through forested countryside in the Berkshire hills. The day starts with a trip to the Hancock Shaker Village, with its numerous original buildings and barns. Continue south to Stockbridge, home of the Norman Rockwell Museum, one of the country’s most famous artists, with his classic take on Americana life. Take the time to also visit Naumkeag, to experience Gilded-Age style and splendor at this marvellous estate, renowned for its whimsical gardens and rare Berkshire “Cottage”. For the final day drive south into Connecticut and visit the lovely villages of West Cornwall and Kent. The latter part of the journey is on the Interstate to ensure an easy trip back to Newark and the port, for cars being shipped back to Europe. Our final night of the tour will be spent at a fabulous, contemporary hotel in the area of Hoboken (Frank Sinatra’s birthplace) in New York, overlooking the Manhatten skyline with views of the Empire State Building, as well as the whole of Manhatten from the George Washington Bridge along to the Statue of Liberty. Depart for the airport and/or home. We can also arrange the option to extend your stay, to allow more time to visit New York. Or take an overnight flight on Saturday and enjoy a full day in Manhattan. We have hand-picked some beautiful, quality character hotels with great charm, in superb locations across New England. From old cedar-shingle coastal properties and exquisite village inns to luxurious mountain lodges and contemporary city hotels. All, of course, have suitable parking for our cars. In most places we shall be staying two nights, with some one-night stops only occasionally. Rooms are well appointed and generously sized (especially by European standards), beds are enormous (6ft plus doubles, or two queen beds) and blissfully comfortable, and the food superb – both dinners and breakfasts, with plenty of choice. All the hotels have been personally visited and inspected by us. We have checked the parking arrangement, the rooms, the available facilities and chosen hotels in lovely areas that we’re sure you will enjoy.